Want more information? 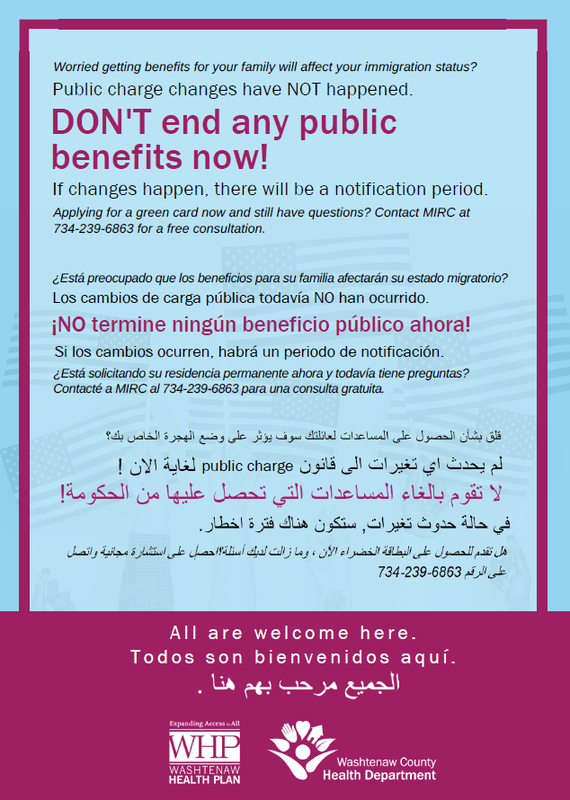 Read the post, Welcome Immigrants—Opposing Public Charge Rules Changes, from December 2018. Click here for a printatble pdf of this poster. Welcoming Week began in Michigan with a Welcome Michigan Statewide Convening on Friday, September 15, 2017 at Washtenaw Community College in Ypsilanti, MI. Participants from all over the state came together to continue work making Michigan a welcoming state for all immigrants. Highlights include the keynote speaker, Tracy Keza, discussing her photographic work, Hijabs and Hoodies, and workshops addressing legal issues, responding to bias and hate crimes, advocacy and community engagement. Washtenaw County government, as well as the cities of Ann Arbor and Ypsilanti, are committed to being welcoming to immigrants. Recently the Washtenaw County commissioners have committed funding and resources to supporting immigrants. Read more here.The City of Ann Arbor and Washtenaw County join other Michigan municipal governments that have signed on as a “welcoming city,” including Detroit, Lansing, Kalamazoo and Macomb County. Fri. & Sat. 9/22 & 9/23: Futsal Tournament, Ann Arbor YMCA. Futsai is an informal five-on-five soccer game bringing together people of different ethnic, racial, and national origins. Follow Welcoming Michigan on twitter and facebook to find out more about what's happening in our state. Welcoming Michigan is part of Welcoming America, which leads a movement of inclusive communities becoming more prosperous by making everyone feel like they belong. Welcoming America believe that all people, including immigrants, are valued contributors who are vital to the success of our communities and shared future. See our Immigrant Info page to read more about immigrants and healthcare. The Michigan Immigrant Rights Center has lots of resources and information. If you or someone you know needs help with an immigration issue, they may be able to help you or refer you to someone who can help you. Right now, they have a lot of information about the ending of the DACA program. The National Immigration Law Center also has many resources and a lot of information on their website. The first few years of a child’s life make a world of difference, shaping who he or she will become, what he or she will achieve and how he or she will contribute to society as an adult. Kelly Stupple is the Child Health Advocate for Success by 6 and is based at the Washtenaw Health Plan. Kelly assists families in obtaining and retaining publicly-funded health insurance and quality medical, dental and mental health services for children, as well as prenatal and family planning care and insurance for women. Irionna, a happy client, with Kelly. For several years, Kelly was the co-chair for Barrier Busters, a collaborative working to remove barriers to housing and health for low income county residents. Kelly co-chairs the Spanish Health Care Outreach Collaborative (SHOC) with Spring Quinones. SHOC is a networking organization of Washtenaw area health, education and human service professionals who serve the Latino community. Kelly is also a member of the Mental Health and Substance Use Disorder Care Work Group of the Washtenaw Health Initiative. She works with children's oral health and infant mortality prevention with an emphasis on disparities. Collaborating with area agencies, schools and medical providers, Kelly works to ensure that all families, regardless of income, country of origin or language spoken, have access to comprehensive and compassionate health care. Kelly has an AB from Harvard with a major in African American Studies and an MSEd in Guidance and Counseling from Hunter College. Her work history includes counseling for students of color, managing grant funds, and working extensively with low-income families and families with complex medical issues, navigating the health system. Buddy's Pizza in Detroit. Kelly's favorite! Kelly also LOVES Buddy's Pizza in Detroit, likes to go for walks, and is married to a public school teacher/musician. She is passionate about Michigan, Ypsilanti, Detroit and Ann Arbor. Her daughter is in 8th grade at Slauson Middle School and will be following in her mother's footsteps, attending Community High School next year. She also has 3 cats and a part-time dog. If nobody does speak your language, welcome to the world of not being understood. It is a most uncomfortable and frustrating place to be. Perhaps if you are a tourist and you are trying to get a coffee from the local café, it may be part of an exotic adventure. However... if you are trying to get health care coverage for your children or yourself, it can be daunting. June is Immigrant Heritage Month, and Michigan is a land of immigrants. Washtenaw County is growing rapidly with migrant groups from many different countries. If you are curious to see what languages we have in Michigan check out this web site. Fortunately there are federal and state laws in place to assure people can access the services they need in their own language. The Department of Health and Human Services policy states that they will provide interpreter services when needed. If an applicant really doesn't understand English, but tries to "get by," the DHHS staff person may understand this to mean that the client's English is good enough to do the application. If a client really doesn't understand English, the client should state that clearly in the beginning. Most of the time, the office will need to call a telephone interpreter line. Don't expect a DHHS staff person to automatically know the language that a client needs help with--or even that a client needs help! Clients need to specifically request interpretation. Clients can bring another adult with them to translate, but DHHS policy states that "Minor children or other non-adult relatives of the client may be used as interpreters in the most extraordinary circumstances and only if other kinds of interpreter resources are not available." Read more here and here. The Marketplace application is available online in both English and Spanish. For other languages, applicants should call the Marketplace at 1-800-318-2596 and request an interpreter. Applicants can also make an appointment for a telephone interpreter. Map of the City of Flint. 2016 Google. As a result of the Flint water crisis, the State of Michigan applied for--and got--a Medicaid waiver that allows Medicaid to serve children and pregnant women who may have been affected by lead in the water, even if their incomes are above typical Medicaid income cutoffs. Pregnant women and children under age 21 whose income is below 400% of the FPL and were impacted by the Flint water system are now eligible for full Medicaid and targeted case management services. Children of women who were impacted while pregnant are also eligible for full Medicaid and case management services. If your income is above 400% of the poverty level but you qualify for geographic reasons, you will be able to "buy in" to Medicaid in the near future. Income limits by household size for Flint Medicaid. If you qualify for Flint Water Group MIChild, you will not have to pay the $10/month co-pay. Young adults up to age 21 and pregnant women who qualify for Flint Water Group Healthy Michigan Plan (or any other type of Medicaid will not have to pay any co-pays or cost-sharing. What qualifies as "impacted by the Flint water system?" Anyone who lived, worked, received childcare services or educational services at an address served by the Flint water system from April 1, 2014 going forward is included. There is no end date. Children who attended schools or went to daycare centers are eligible. People who work in Flint but live in another Michigan county are eligible. You must be a Michigan resident. If a 19 year old took a class at UM-Flint, s/he is eligible. If you lived in Flint in June 2014 but moved to Washtenaw County, you are eligible. I believe I am eligible, what do I do? You can apply online at michigan.gov/mibridges. When you apply, you will be asked if you consumed water from the Flint water system. The system will also ask you for the city, state, zip code and location type (home, work, school) where you consumed water. You do not have to know the exact address. At this time, you only have to attest that you consumed water from Flint Water System. In the future it may be necessary to provide proof. I live in Flint and already have Medicaid, so does this matter to me? My family was denied Medicaid but I think we qualify for the Flint Water Group Medicaid. What do I do? If you were recently denied Medicaid but believe you are eligible for Flint Water Group Medicaid, contact the Beneficiary Help Line 1-800-642-3195 or your caseworker to report that you are part of the Flint Water Group. Enrollment for Medicaid is open anytime, reapply anytime at michigan.gov/mibridges. If you need help, please contact an agency who can help you. Is Flint Water Group Medicaid different from other Medicaid? Yes. Flint Water Group Medicaid includes all Medicaid services (medical, dental and vision) AND targeted case management services. Targeted case management services include an assigned caseworker from Genesee Health System who will coordinate access to needed medical, social, educational and other services. Contact your doctor, your Medicaid health plan or call the Genesee Health System at (810)257-3777 to receive the extra services. I am an immigrant. Can I still qualify? If you are an immigrant who is a naturalized citizen, a green card holder for more than five years, or a refugee or asylee, you will qualify for the Flint Water Group or other Medicaid. If you do not have eligible immigration status (including having a green card for less than five years, a work permit, a student visa, or no immigration documents at all), you only qualify for the emergency services Medicaid. However, if you meet the location and income criteria, you could qualify for Emergency Services Only Flint Water Group Medicaid even at a higher income level. The Category Code will identify someone with a refugee or asylee status. For example, RE (refugee) or AS (asylee). Some immigrants have a waiting period before they are eligible for full medical coverage, and until then they receive Medicaid- Emergency Services Only. You can find out about services for most immigrants here, however the rules are different for refugees and asylees. After these first eight months, most refugees and asylees will be eligible for full benefits, such as the Healthy Michigan Plan, Healthy Kids, or MIChild. 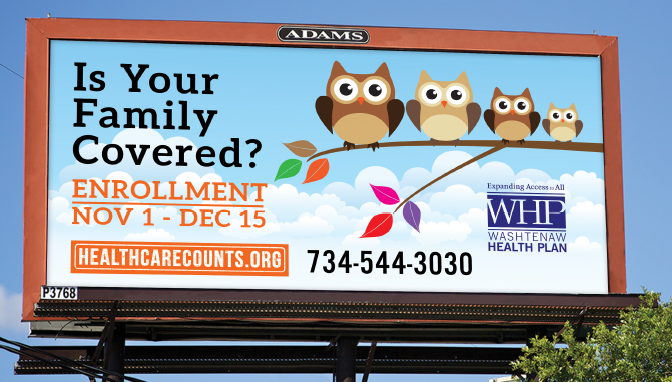 If you think you might be eligible for full benefits, but have been denied or only have coverage for limited services contact Washtenaw Health Plan at (734) 544-3030. Jewish Family Services is an excellent resource in Washtenaw County for immigrants of all categories. The Resettlement Program specifically assists refugees with the transition to living in the United States, but they also offer citizenship and English as a Second Language classes geared toward anyone. Contact Jewish Family Services at (734) 769-0209. To be qualified for full Medicaid, you must not only be income eligible and "lawfully present" in the United States, but also be either a citizen of the United States, or a "qualified" immigrant--typically a Permanent Resident card holder for at least five years. Of course there are some exceptions... refugees, for example, but we'll get to that another time. While people who don't meet that criteria cannot get full Medicaid, there are several other ways for them to access health coverage. Emergency Services Only (ESO): Regardless of residency status, anyone living in Michigan that would otherwise qualify for Medicaid, can receive ESO. This means that in the case of an emergency, they can go to the hospital and not be left with medical bills. ESO covers bills only in the case of a true emergency. For example, falling down and breaking your leg or having a heart attack is certainly an emergency. ESO may not cover a situation not seen as a true emergency, perhaps going to the ER to get a strep throat test. While it is up to the doctor and hospital to determine what qualifies, if you are in need of medical attention, worry about possible bills later, and immediately seek the care you need. Maternity Outpatient Medical Services (MOMS): A pregnant women who would qualify for coverage except for her immigration status can apply for MOMS, which covers bills related to the pregnancy. This includes prenatal visits, the delivery and postpartum care for two calender months after the pregnancy ends. The MOMS program is in place in hopes that the infant, who will likely be a born a U.S. citizen, has proper medical care while in utero. To apply for ESO Medicaid and MOMS, one uses the same application as one does to apply for full Medicaid: link. Marketplace: Neither ESO or MOMS coverage meet the minimum standards of health insurance under the Affordable Care Act. A person with any "authorized" status in the U.S. (Permanent Resident card, Work Permit, student visa etc.) may need to look to the Marketplace to have coverage that meets the mandate, though they can still have the ESO and/or MOMS to supplement. The Marketplace application is found online at healthcare.gov. Helpful Hint: Sometimes the application process can be confusing! We are here to help you. We have English, Spanish, Arabic and French speakers in our office--and if you speak another language, we have access to Language Line interpretation.Please call us at (734) 544-3030 or walk into our offices, Monday through Friday, 9-4, to get the help that you need!